“Professor #FollowFriday” is an editorial series focused on academics’ best practice in digital communications. Every Friday, I highlight one academic who is strategically leveraging the power of digital communications. The goal of this feature is that if you are an academic or thought leader looking to establish an online presence, you will be able to draw on this archive and use it as a source for inspiration in creating / refreshing your own personal brand presence. I was curious to find a professor who has integrated digital communications tactics into the classroom. Steven Johnson seems to be doing just this. Particularly of interest is the way he has integrated gamification into the classroom (gamification is the use of game thinking and game mechanics in non-game contexts to engage users in solving problems). 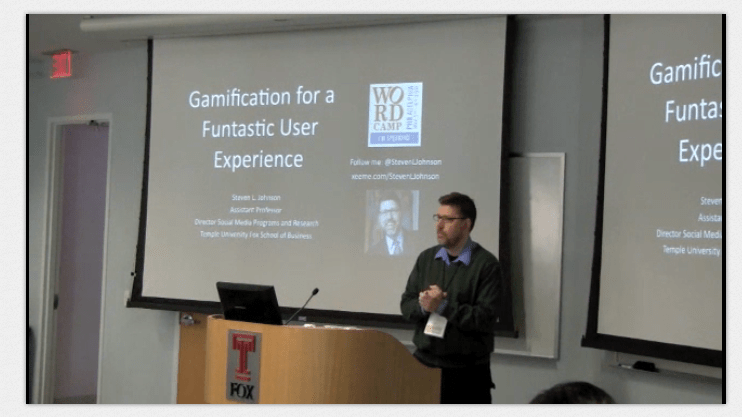 He seems to be taking his research on gamification and applying it directly in the classroom. For professors looking to integrate gamification in their courses, studying Stephen Johnson’s approach would be a good investment of time. Regardless of the subject being taught, gamification has potential and can serve as a valuable means to students’ learning different concepts. From my reading, Johnson has set up a leader board to recognize students completing different social media related tasks. This particular blog post explains in more detail. Johnson is communicating his expertise in gamification and his other research interests through his different owned media channels. I particularly like his YouTube videos that show how to use different social media tools in approximately two minutes (though it would be nice if there were a bit more thought leadership content posted there regularly. Overall, it is surprising to see so few professors actually communicate their thought leadership through their own branded YouTube channel.) Johnson also seems to be effective at communicating his approach in the classroom to the media. Check out his site for more information.